Digital thermostat /wired controller for fan coils. Termostato fan coil. Modbus is optional. 2 pipe or 4 pipe. 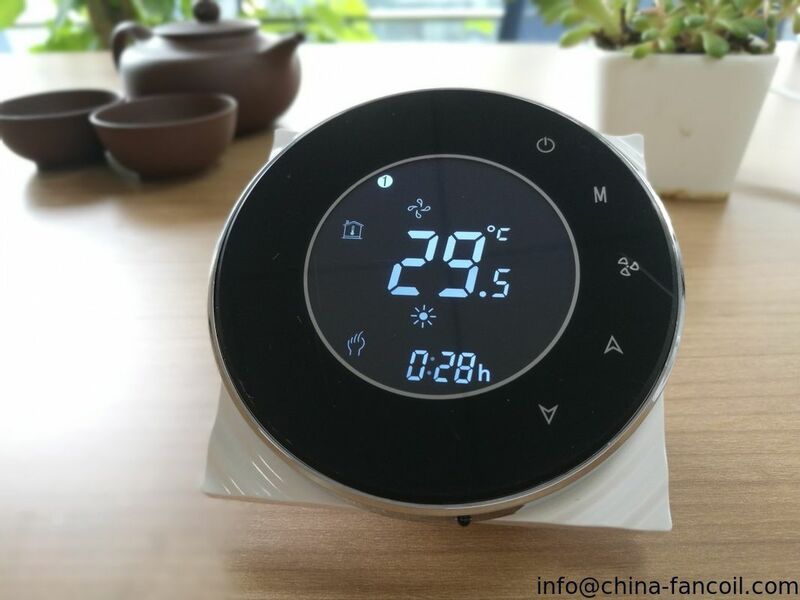 Control logic: When the temperature reaches the set-point, Valve will be close and fan keep on running. When the temperature reaches the set-point, Valve and Fan will be closed together. 1. Negative black Round touch screen and Silver Frame. 2. White, black or gold housing all available. 3. The visible thickness above the wall is only 11mm. 4. Hidden 86mm box and European 60mm round box both available. 7. Amazon Echo or Google Home accessable. 8. Temperature for ℃ & ℉ is changeable. 9. Auto restart function available. 10. 5+2 six periods programmable maximize comfort and economic.